This story is as beautiful as its cover! Everything about it was truly captivating. Pachinko, tells the story of a Korean family who immigrates to Japan. It unfolds across three generations and is told from an omniscient point of view. The story begins in Korea with the birth of Sunja, who is the pride and joy of parents Yanijn and Hoonie. Tragedy and hard times fall upon the family through this short introduction, and we soon learn that Sunja is pregnant. As an unmarried woman, this threatens to shame her entire family. Good fortune soon arrives in the form of Isak, a Christian minister, who is on his way to settle in Japan. Isak offers generously to marry Sunja, and their quick yet necessary relationship manifests in subtle yet poignant ways. Once the couple immigrates to Japan, they come to realize that the country is not quite as they imagined. The discrimination they face for being Korean and living in Japan creates a struggle for survival that lasts for the rest of their lives and carries into the lives of their children and grandchildren. In addition to this lovely couple, we come to know and care for Isak’s brother, Yoseb and his wife, Kyunghee. Childless, in love, and hardworking they serve as supporting characters who share their lives with Sunja, Isak, and their children. 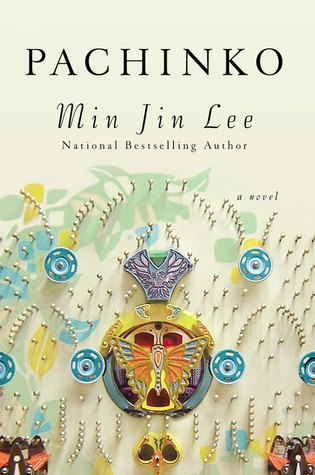 Min Jin Lee crafts a true masterpiece with Pachinko. This book brings up many heavy themes like cultural identity and how one integrates/conceals two culture identities in order to survive. The story also brings up the value (or non-value) of women. Then there is also this idea of history repeating itself within families. Lee expertly creates tension, evokes emotion from readers, and transports you to the many times and places within this sweeping novel. You become one with the family, their story becomes part of your story, and I felt this book is one that will change you if you let it. I don’t have much else to say because I think this one speaks for itself, but I highly recommend this one to everyone!